Please keep an eye on this page for details of upcoming workshops. Alternatively, you’re welcome to drop Susan a line here expressing your interest in a workshop. This workshop day will take place in KILLARNEY where we will spend the day in reflection, immersed in the magnificent surrounds of our National Park. We plan to spend most of the day outdoors but will have contingency plans should the weather challenge us! This workshop will be jointly facilitated by Susan and John Cummins. Details of John’s qualifications and experience can be found here. More details to follow but if you would like to provisionally reserve a space on this workshop, please contact Susan on this link. If you are a beginner, these half-day practical and informative workshops will introduce you to the theory, principles and practices of Mindfulness. Information on follow-on courses will be available at each workshop. If you already have experience of Mindfulness, these workshops will provide great opportunities to refresh your practice, get yourself back on track and meet up again with other like-minded people. The workshops will provide a little bit of calm, allowing you to establish an intention of self-care. Booking and advance payment for each workshop is essential. Please get in touch if you would like to be added to the mailing list and notified directly of upcoming workshops...... enquire here or feel free to contact Susan on 087 2838171. 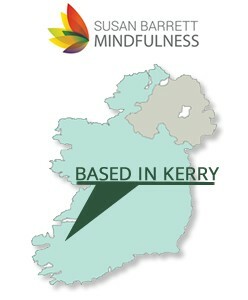 Also, if you would like to consider taking part in either the Introduction to Mindfulness course in Tralee beginning in February or the the Mindfulness Based Stress Reduction course beginning in Killarney in late January, please click on the relevant links or feel free to get in touch directly here. You are also most welcome to contact Susan on 087 2838171 if you would like to discuss which course might best suit you .